A few months ago I wrote an blog post about a Silverlight 3.0 LetItSnowBehavior. This Behavior can be used to add a Snow effect to a Canvas. Very usefull if you want to create a christmas card. This behavior was always showing you falling snow flakes. You couldn't stop and (re)start the gameloop. The best way to implement this is by adding Commands to the behavior. This allows you to select one or more triggers to Start or Stop the gameloop. 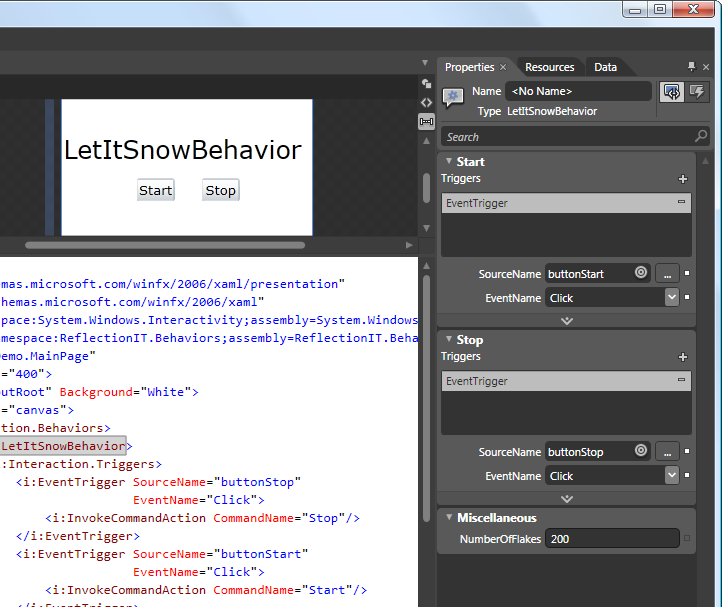 I have added the Start and Stop properties of the type ICommand to the LetItSnowBehavior class. In the constructor I have initialized these properties with new ActionCommand objects (Microsoft.Expression.Interactions.dll) and delegates to the OnStop() and OnStart() methods. Triggers attached to these commands will execute the these methods. You can use Expression Blend to attach triggers to the Commands. Select the LetItSnowBehavior object and open it properties. Click the + button for the Start property and select an EventTrigger. Select the 'buttonStart' as source and the 'Click' as event. You can even add multiple triggers to the command. You can download the code from here. 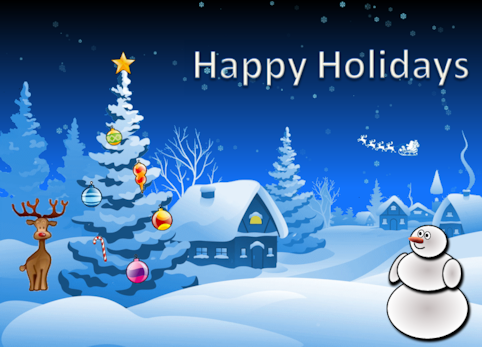 Click the following image to see my Christmas card which I have created using Silverlight 3.0 and Expression Blend. I didn't have to write any line of C# code. I only re-used some of my existing behaviors: LetItSnowBehavior and ControlMediaElementAction. Op dit moment ben ik als Silverlight ontwikkelaar op zoek naar een project. Bent u op zoek naar een ervaren silverlight specialist/architect neem dan contact met mij op. Zie ook mijn CV voor extra infromatie over mij. I have written an Simple Report Library for Windows Forms applications a few years ago. The new Printing API makes it possible to create a similar solution for Silverlight 4. You create a report by instantiating a new ReportDocument object. You can set the Title and the SubTitle. Next you add Paragraphs (FrameworkElements) to the report. Finally you Print the report. 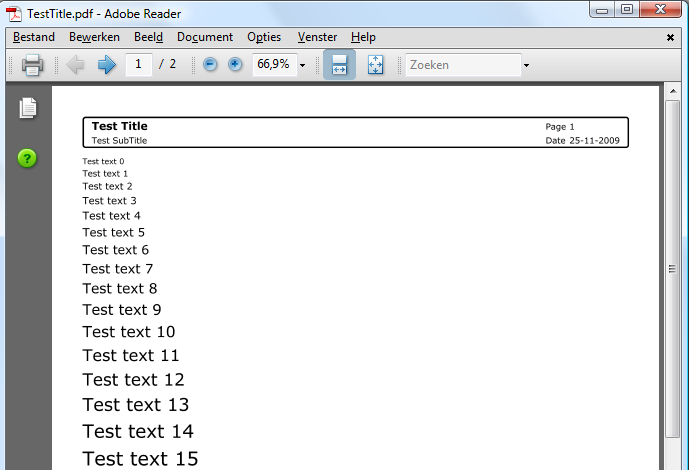 This prints the following Test Title.pdf if you print it to a PDF writer. SilverlightXP is a web application where Silverlight Developers and Designers can post links to controls, resources and other interesting information about Microsoft Silverlight. I have created a simple Flip Clock using Silverlight 3 and Expression Blend 3. It uses some simple animations to flip the hours, minutes and seconds. I hope you like it. You can download the sourcecode from here. Controlling a MediaElement in Silverlight isn't difficult. You use the Play(), Stop() and Pause() methods in your code. I have written the 'ControlMediaElementAction' Behavior which makes it even easier. You don't have to write a single line of code. The ControlMediaElementAction is associated with a MediaElement. It has a ControlMediaElementOption which you can set to Play, Stop, Pause and RewindAndPlay. The Invoke() methods controls (Plays, Stops, Pauses and RewindAndPlays) the AssociatedObject (MediaElement). You assign a ControlMediaElementAction to a MediaElement. In Expression Blend you drag it from you Asset tab and drop it on a MediaElement. Then you can select your trigger and set all other properties from the Properties tab. In the following example I have 3 ControlMediaElementAction assigned to a MediaElement. The first is triggerd by the 'Click' event of 'buttonPlay' and uses the 'Play' option. The second is triggerd by the 'Click' event of 'buttonPause' and uses the 'Pause' option. The third is triggerd by the 'MediaEnded' event of the MediaElement and uses the 'RewindAndPlay' option, making the movie loop. 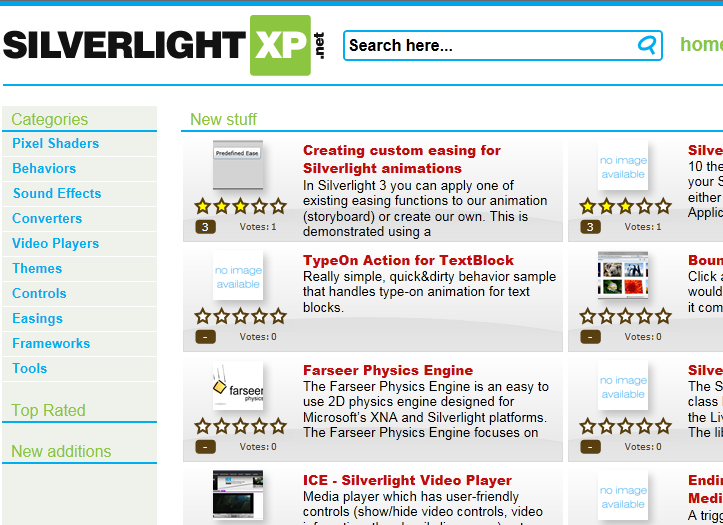 I'm proud to announce the Silverlight XP.net website. It is a web application where Silverlight Developers can post links to interesting information, controls, resources e.t.c. We invite you to submit your Silverlight resources. 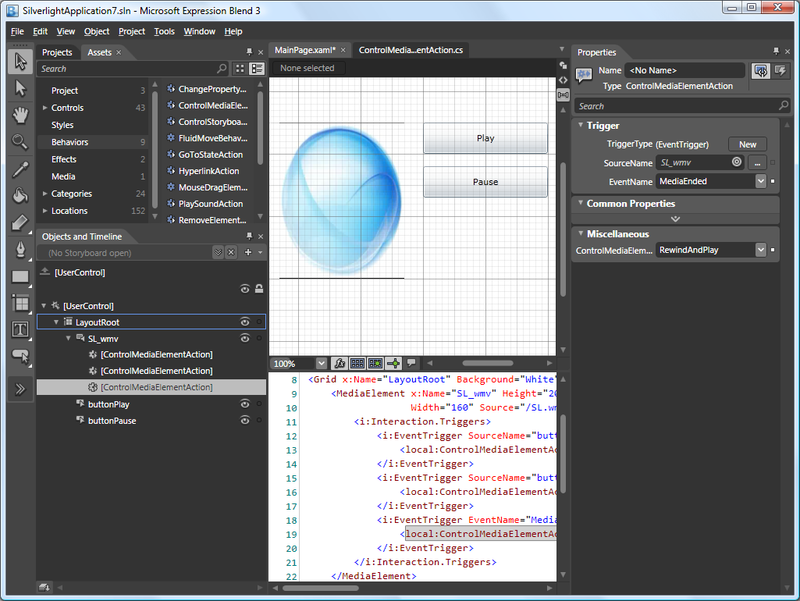 Silverlight XP was created by Loek van den Ouweland and me, and is currently at version 1.0. We plan to add a lot of features soon. We don’t have a feedback-function yet. Please drop comments about the website by mail. Silverlight is een 'cross-over browser plugin' van Microsoft die het mogelijk maakt om animaties, audio en video weer te geven in de webbrowser (zoals bijvoorbeeld Explorer, Firefox, Safari). Docenten Fons Sonnemans en Loek van den Ouweland verzorgen deze interactieve en praktijkgerichte trainingen voor zowel geinteresseerden als startende en meer ervaren programmeurs en grafisch vormgevers. Silverlight 3.0 has a great new feature called Behaviors. You can use them for a lot of things, one of them is to create a SNOW effect in a canvas. I know it is not yet Christmas but I like to be prepared. If you don't know what a behavior is or how to write them read first this blog post from Andrea Boschin. All postings/content on this blog are provided "AS IS" with no warranties, and confer no rights. All entries in this blog are my opinion and don't necessarily reflect the opinion of my employer or sponsors. The content on this site is licensed under a Creative Commons Attribution By license.